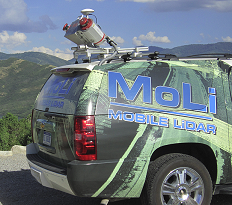 Riegl USA is proud to announce Surveying Solutions, Inc. (SSI) as a new Mobile Mapping User. SSI will utilize the Riegl VMX-250 with the CS6 Camera System to collect detailed topography, asset management, and precision survey data at near highway speeds. The use of the system will allow for safe non-hazardous working conditions. The VMX-250 mobile scanning system consists of two VQ-250 scanners on a mounted platform accompanied by a GPS-INS and up to 6 digital cameras or video equipment. Accommodating multiple cameras ensures a 360 degree field of view. Most standard station wagons or off-road vehicles can be optimized for easy installation and the scanners are powered directly from the cars battery. Data acquisition is operator controlled using a standard laptop. The system was designed with the user in mind– set up is fast, easy and safe! The cutting edge echo digitization technology used in the VMX-250 mobile LiDAR scanning system penetrates foliage, fences and other obstacles. The system’s online waveform technology allows for more than 10 measurements per laser shot. The combination of these technologies results in laser precision of 1cm or better and accuracy 3cm or better. The new high performance fully calibrated VMX-250-CS6 Camera System completes the Riegl VMX-250 Mobile Laser Scanning System by supporting six digital color cameras. The new system is extremely compact and user-friendly. As seen below, the VMX-250-CS6 is positioned on a lightweight aluminum frame for versatility and stability. Riegl’s RiAcquire Software manages acquisition of precisely time stamped images by the VMX-250-CS6 in addition to the acquisition of the VMX-250 laser scanner data. In addition, the software controls the camera’s parameters and enables image monitoring during acquisition in real time. The key factor to Riegl USA’s reliability and success is the full service experience offered to our customers, from your initial purchase, integration of the system, training and support Riegl USA stands out as an industry leader. SSI is a professional services firm specializing in a wide range of surveying services. Being a full service surveying company, SSI provides professional services to a wide range of clientele that includes government, residential, municipal, engineering design, and private development clients. SSI is adept at providing a leadership role on all types of surveying projects. In addition, SSI strives to support the needs of other firms in a sub-consultant role to meet any project demands. Providing professional surveying services for more than a decade, SSI’s dedicated staff is fully trained and experienced to complete the work necessary to take any project from planning to final deliverables. With extensive experience in surveying and LiDAR, SSI is a major asset to any project team anywhere in the world. Being certain that LiDAR will continue to revolutionize the way survey projects are completed in the future, the SSI team is focused on providing the benefits of LiDAR today. Riegl USA Surveying Solutions, Inc.